Although not a new brand, 2017 Leaf Valiant Football makes its return to the hobby with some noticeable changes. In addition to the customary on-card signatures and themed designs, every box delivers a BGS-graded autograph. 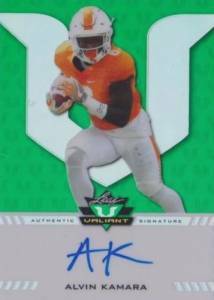 Only featuring hard-signed cards, the 2017 Leaf Valiant Football checklist is built around the main Valiant Autograph set adorned with a large "V" background that occupies nearly three-fourths of the card. There are also multiple parallel levels to chase. Other signed options include Big Targets, Field Generals, Speed Kills, TD Machines and Tenacious "D" autograph inserts. Just like the base cards, the inserts have a rainbow of color parallels. While collectors can expect three signed cards in every box from the previously noted sets, the fourth and final autograph is of the graded variety. Not only that, but the graded card is guaranteed to be either a BGS 9.5 or BGS 10. The newer Black Label BGS 10 examples are also a possibility. 2017 Leaf Valiant Football is a limited release with the expected production being less than 200 cases. This puts overall totals under 2,400 boxes. There is also an even more limited Proof edition, which only includes pre-production cards from the set. 2017 Leaf Valiant Cooper Kupp TD Machines Purple Auto 15 Beckett 9.5 10 Rams! Green is the base version for each set. 55 cards. Serial numbered #/50. Shop on eBay. PARALLEL CARDS: Orange #/25, Purple #/15, Yellow #/10, Black #/5, Red 1/1. 5 cards. Serial numbered #/50. 8 cards. Serial numbered #/50. 55 cards. Serial numbered #/50. 69 cards. Serial numbered 1/1. Only applies to cards noted below. very interesting concept including a beckett graded card in the box. I got two with 10 grade and 10 auto. I was wondering if there were any black tens and I got one yesterday. it was only Joshua dobbs but I live in Pittsburgh so its nice to have. Really like the look of the cards and the fact they have graded card in each box and cards are hard copy autos instead of a sticker auto. Love that these cards are “hard signed” rather than a crappy sticker auto.